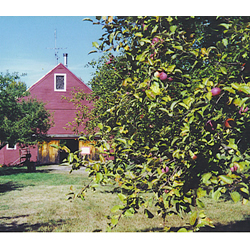 Apple Annie is a small family run orchard with 300+ trees, off the beaten track, a quiet and friendly place for a family outing. Whether you pick your own apples or buy apples already picked, you are welcome to take your time, walk around the orchard, picnic if you want, or just sit and relax. In the fall we offer low-spray apples, unpasteurized cider, fall vegetables, jams and jellies from our own produce, pies, cider donuts and baked goods. Our goal is a sound, healthy, tasty apple, not an apple with an unblemished complexion: therefore, we use as little as possible of the least toxic chemicals. We believe that the flavor of an apple, or other farm products is enhanced by connection with the place where it is grown, and we hope you will feel that connection here.